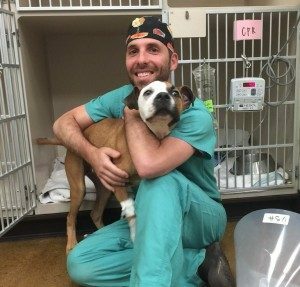 In addition to being a surgeon at the North County Veterinary Specialty Hospital, Dr. Seth Ganz also serves as Veterinary Relations Advisor on FACE’s Advisory Committee. Dr. Ganz’s dedication to saving the lives of pets in need of urgent veterinary care is obvious. “As a doctor, I like knowing that there may be a chance to help an animal and the family when another option isn’t available,” says Dr. Ganz. “I’m just always grateful that I am in a position where I can help!” Dr. Ganz has a doctorate of veterinary medicine from Tufts University School of Veterinary Medicine. He completed a 3 year small animal surgical residency in Wisconsin and is board certified by the American College of Veterinary Surgeons. Dr. Ganz performs a wide range of surgeries, including orthopedic and soft tissue surgery as well as neurosurgery. What’s his most memorable FACE case? “They are all equally memorable, whether the actual case was more severe/dramatic/unusual, it doesn’t matter,” says Dr. Ganz. Dr. Ganz is grateful for the opportunity to perform surgeries in pets that would otherwise be debilitated, die, or be euthanized for economic reasons. Dr. Ganz values his collaborative relationship with FACE. “It’s a special group of people and it was started purely as a desire to solve a real problem and make a real difference,” he notes. As for himself, “It’s a chance to be involved with a group that has shown a determination to make a significant impact on the lives of so many animals and their families here in San Diego,” he says. While Dr. Ganz enjoys his work at the hospital and with FACE, he also values spending his time away from work with his wife, 2 ½ year old fraternal twin boys, and one-eyed pit bull mix named Winter. Dr. Ganz enjoys running and biking, and hopes to travel to a new destination with his wife when life gets a bit less hectic! Dr. Ganz enthusiastically recommends that other veterinary practices consider working with FACE. “They want to help,” he says. “They want to get their donations to the pets that need them. Vets want to help every patient. It’s a win-win. Enough said!” We couldn’t agree more, Dr. Ganz! Thanks to you and all of your colleagues at VSH for helping us save the lives of pets in need!